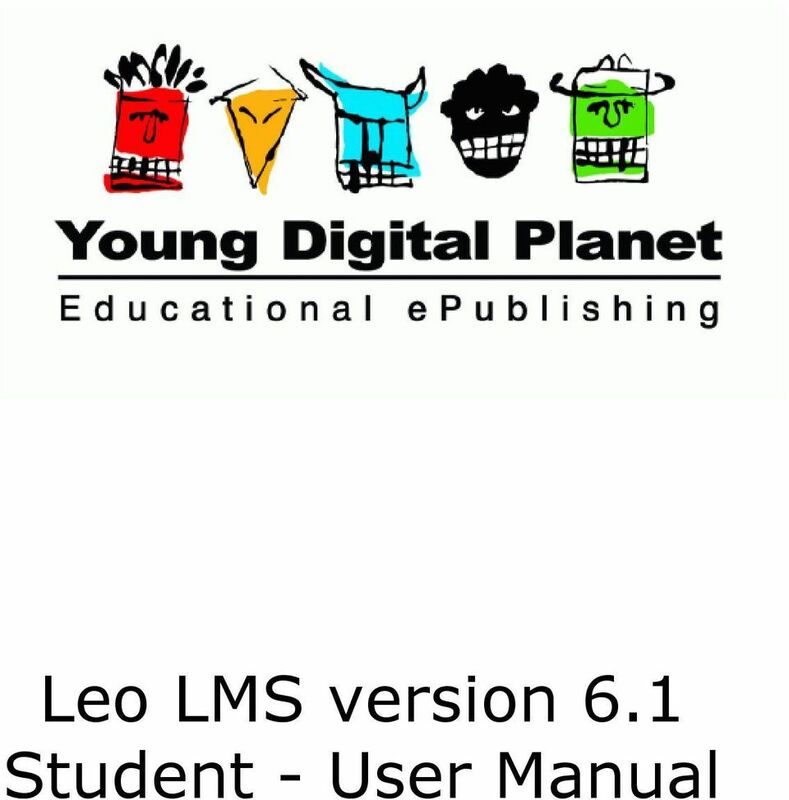 Download "Leo LMS version 6.1 Student - User Manual"
2 Leo LMS version User Manual by Young Digital Planet Young Digital Planet developed LMS 6.0 in direct response to the growing market demand for a comprehensive and versatile Internet based elearning platform. The system allows effective management of complex training processes and competently manages all aspects involved in the corporate training process from user registration, content assignments, monitoring students activity, storing results and presenting reports. 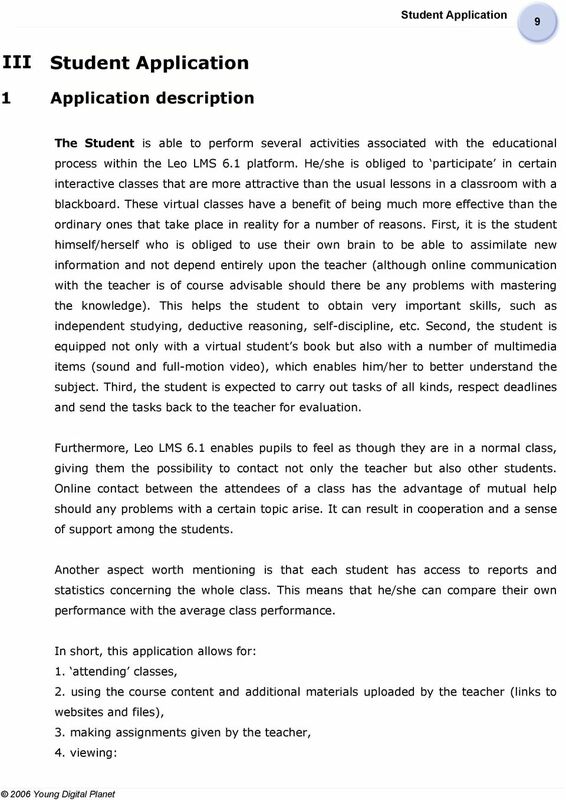 5 Introduction 5 I Introduction Leo LMS 6.1 is a complete online e-learning platform designed to fulfil a multiplicity of educational needs. It enables the creation of a learning portal in any institution. 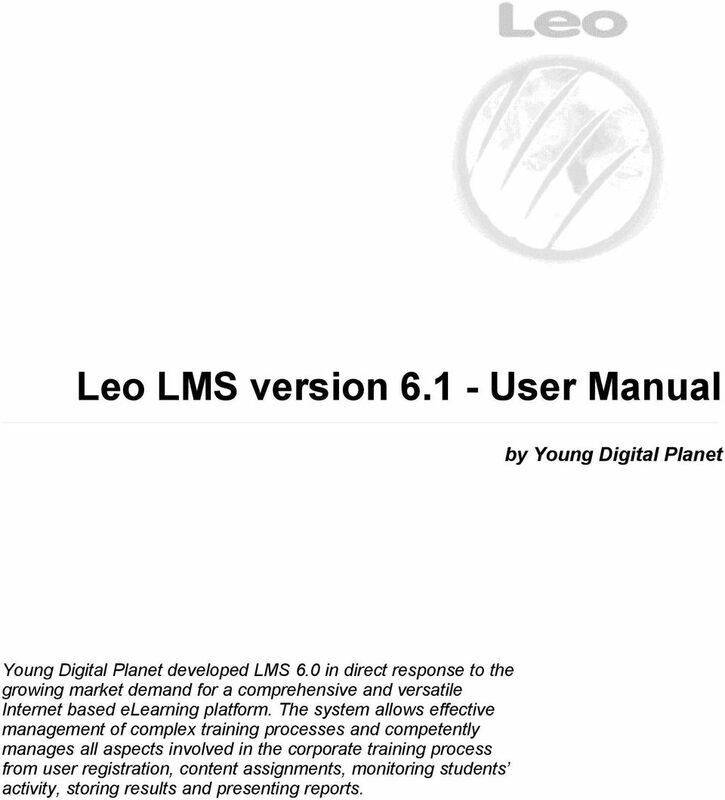 The Leo LMS 6.1 software allows effective management of complex learning processes. What is more, it competently handles all aspects involved in the educational process, from user registration, content assignments, monitoring students activities, storing results to finally presenting reports. 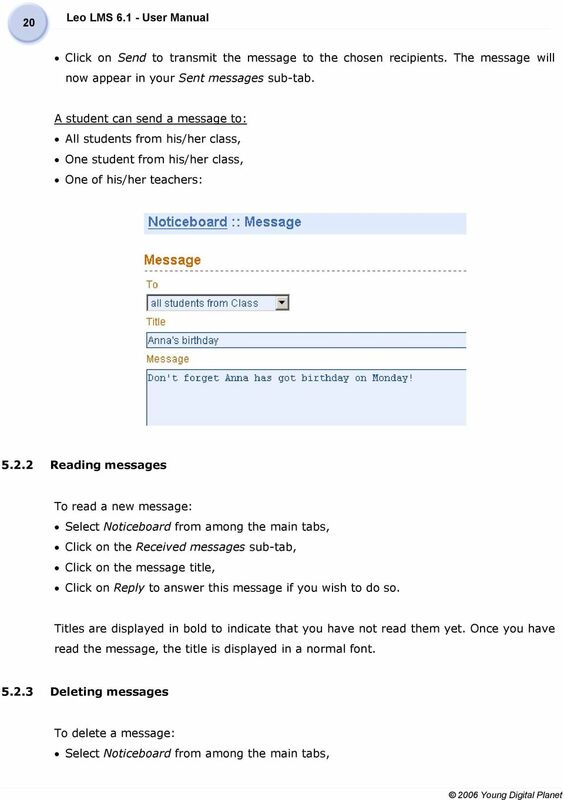 The educational content of the Leo LMS 6.1 system is obtainable through standard Internet browsers. That is why every user in any location (at school or at home) can participate in a course and accomplish the basic principles of e-learning studying at the time and place of their own choice. 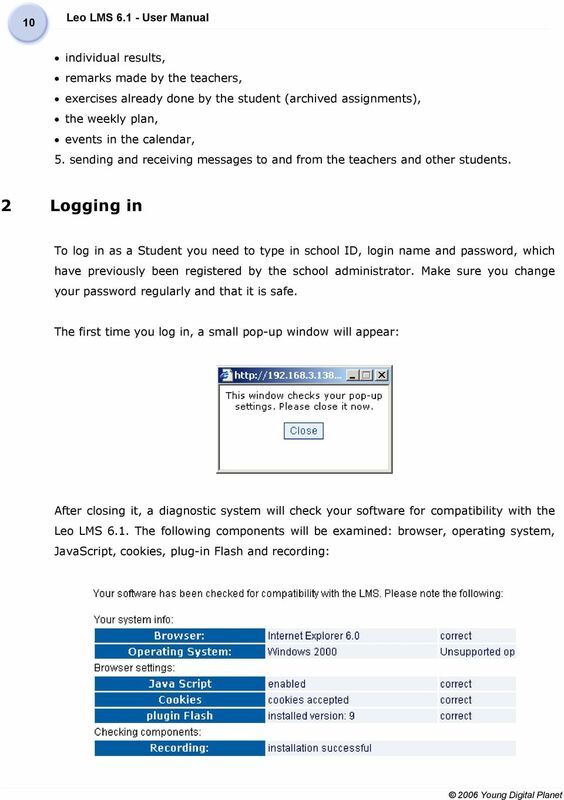 Leo LMS 6.1 consists of 5 different roles: Portal Administrator who is responsible for creating schools, adding and assigning courses to the schools and creating users especially school administrators, School Administrator who creates classes, organises them and adds users (students, teachers and parents) to the school, Teacher who manages the students educational process, Student who attends classes, makes assignments and sends them to the teacher, Parent who can monitor his/her children s activities and attendance. 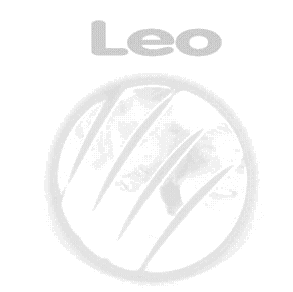 7 Technical requirements 7 II Technical requirements Explanations and comments: Leo LMS 6.1 works in the following operating systems: - Windows 2000 / XP SP2 - Linux - any current stable distribution - Mac OS X. 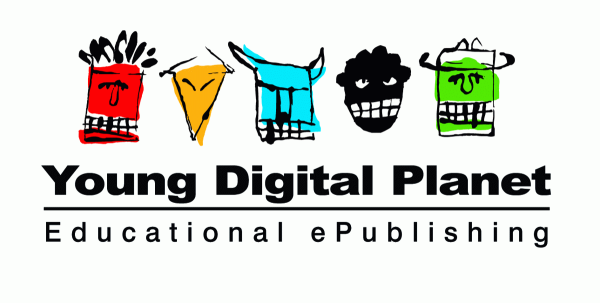 Flash Player must be installed as a plug-in and it must be accessible from a web browser. 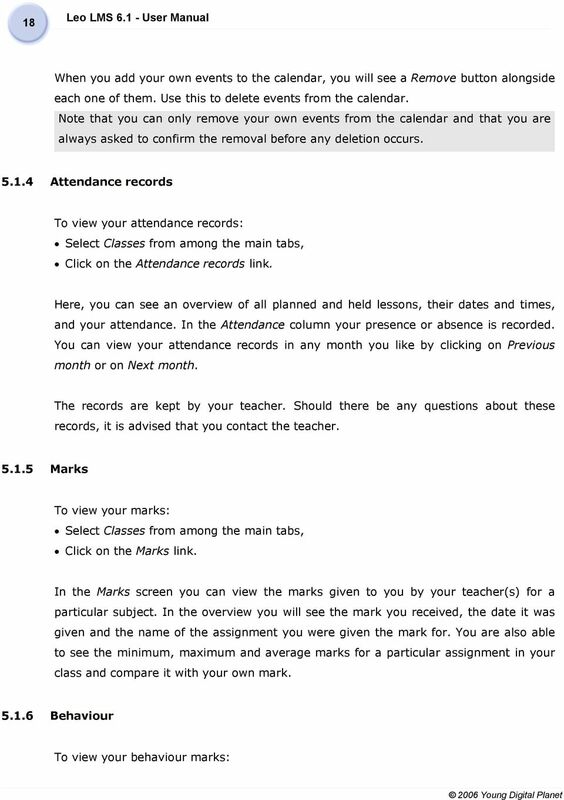 Some courses include a speech-recording application. This application works fully only when integrated with Internet Explorer 6.0 browser in Windows XP operating system. 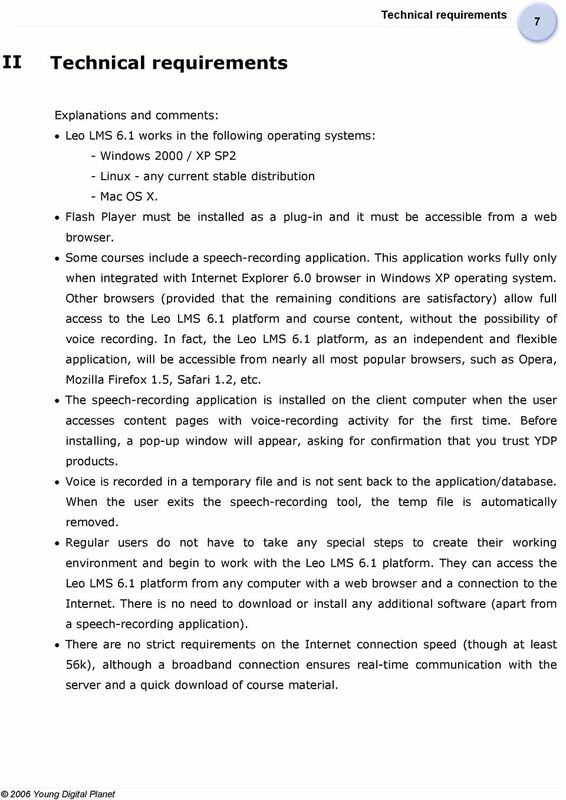 Other browsers (provided that the remaining conditions are satisfactory) allow full access to the Leo LMS 6.1 platform and course content, without the possibility of voice recording. In fact, the Leo LMS 6.1 platform, as an independent and flexible application, will be accessible from nearly all most popular browsers, such as Opera, Mozilla Firefox 1.5, Safari 1.2, etc. 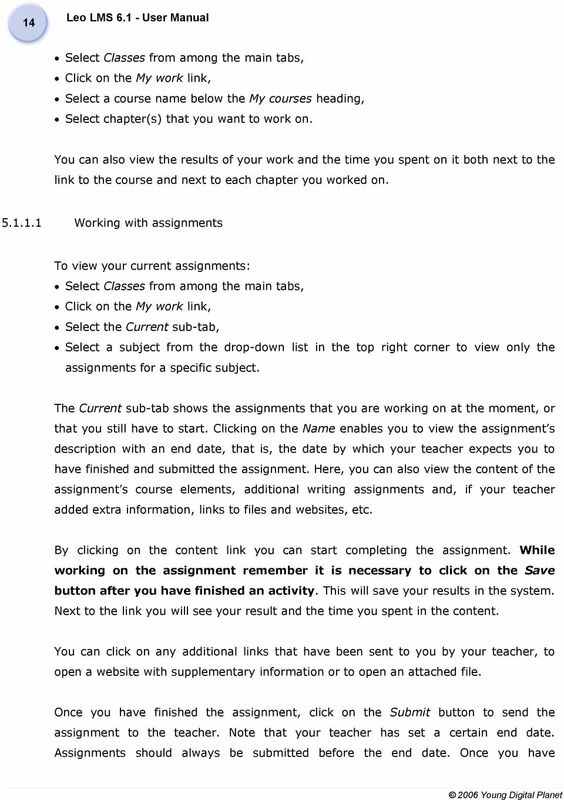 The speech-recording application is installed on the client computer when the user accesses content pages with voice-recording activity for the first time. 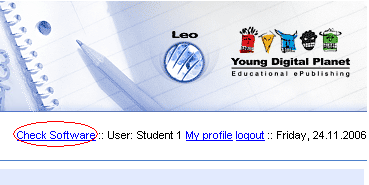 Before installing, a pop-up window will appear, asking for confirmation that you trust YDP products. 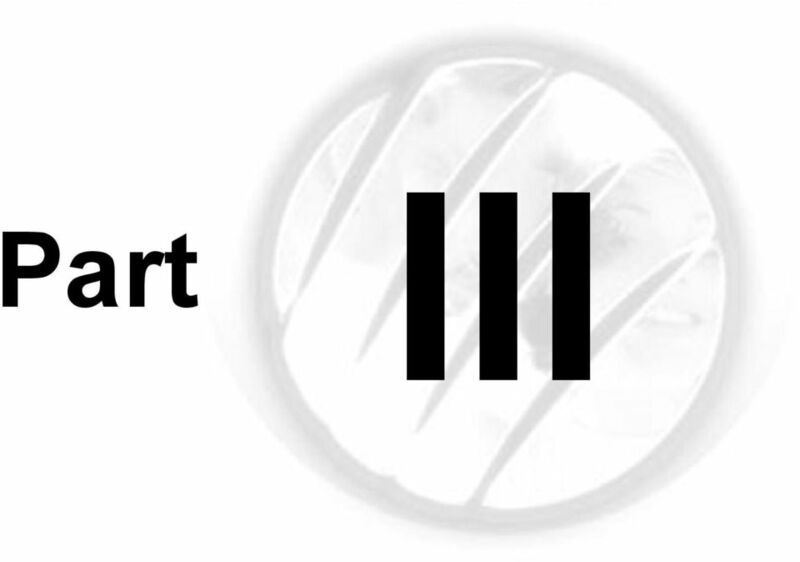 Voice is recorded in a temporary file and is not sent back to the application/database. 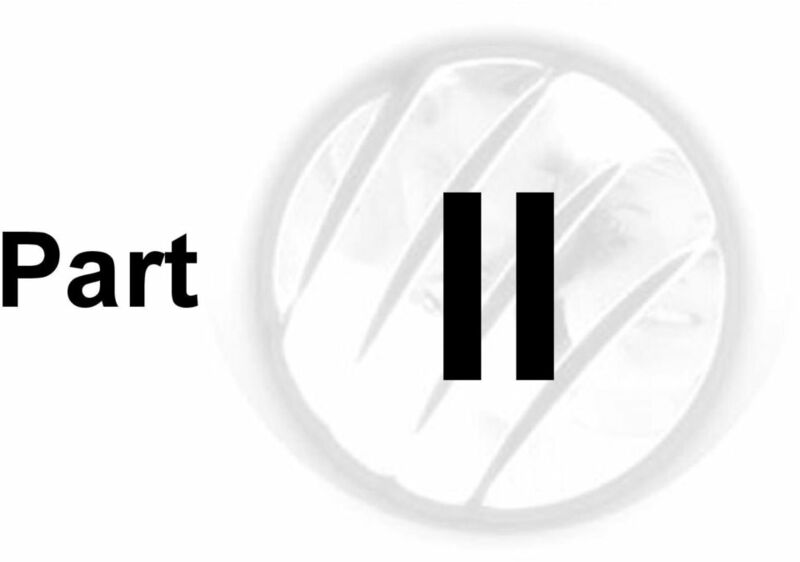 When the user exits the speech-recording tool, the temp file is automatically removed. Regular users do not have to take any special steps to create their working environment and begin to work with the Leo LMS 6.1 platform. 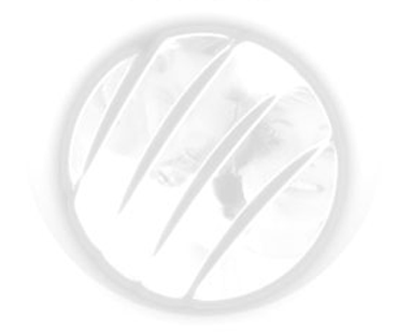 They can access the Leo LMS 6.1 platform from any computer with a web browser and a connection to the Internet. There is no need to download or install any additional software (apart from a speech-recording application). There are no strict requirements on the Internet connection speed (though at least 56k), although a broadband connection ensures real-time communication with the server and a quick download of course material. 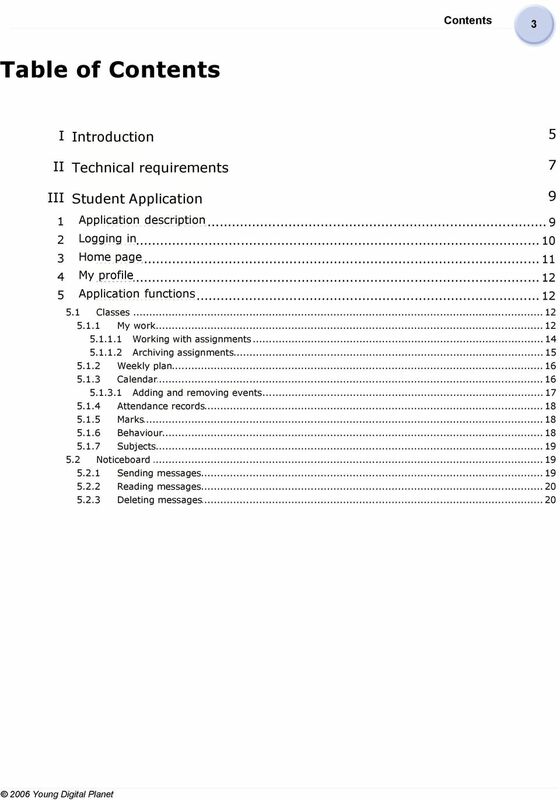 11 Student Application 11 You can also gain access to the diagnostic system through the Check software link at the top of the home page: Note that once you have logged in on one computer and you are using one browser window, you should not log in on another computer or in another window. You can do that, however your previous session will end and any unsaved data will be lost. The system always warns you of this. 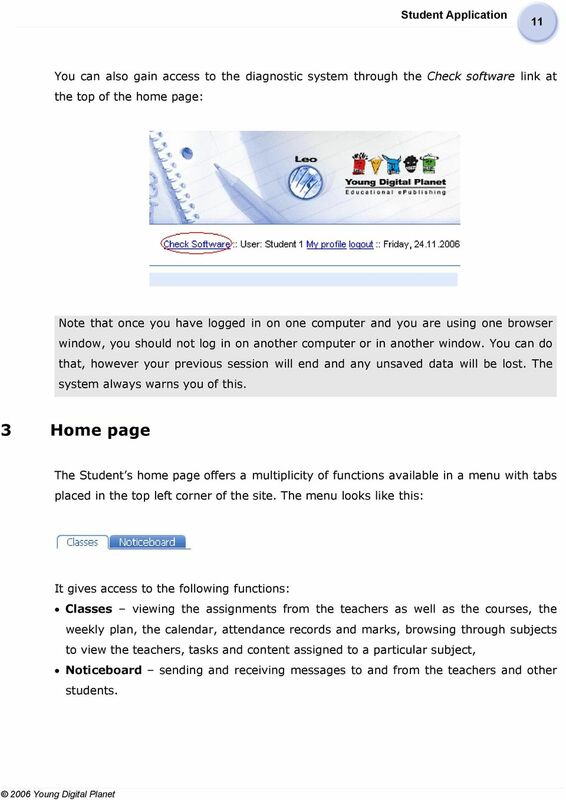 3 Home page The Student s home page offers a multiplicity of functions available in a menu with tabs placed in the top left corner of the site. 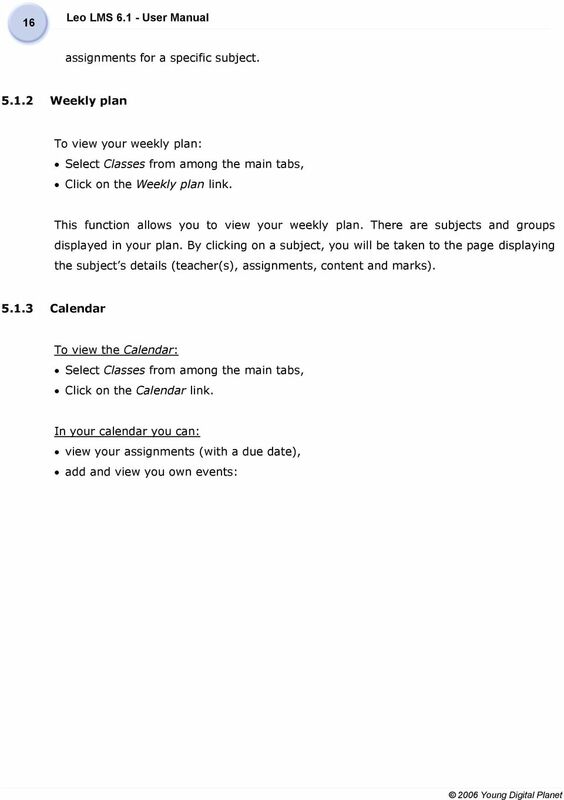 The menu looks like this: It gives access to the following functions: Classes viewing the assignments from the teachers as well as the courses, the weekly plan, the calendar, attendance records and marks, browsing through subjects to view the teachers, tasks and content assigned to a particular subject, Noticeboard sending and receiving messages to and from the teachers and other students. 17 Student Application 17 You can scroll through your calendar by year and month (located above the weekdays) and through week numbers (located on the left). Clicking on a certain day will display the events for that day. 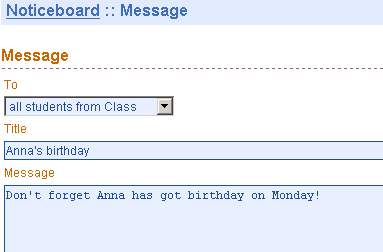 The days with added events are displayed in bold. 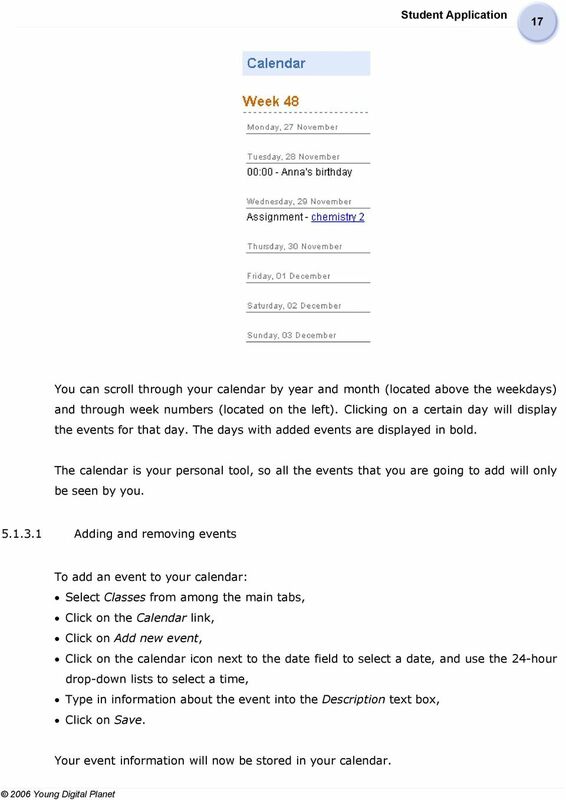 The calendar is your personal tool, so all the events that you are going to add will only be seen by you Adding and removing events To add an event to your calendar: Click on the Calendar link, Click on Add new event, Click on the calendar icon next to the date field to select a date, and use the 24-hour drop-down lists to select a time, Type in information about the event into the Description text box, Click on Save. Your event information will now be stored in your calendar. 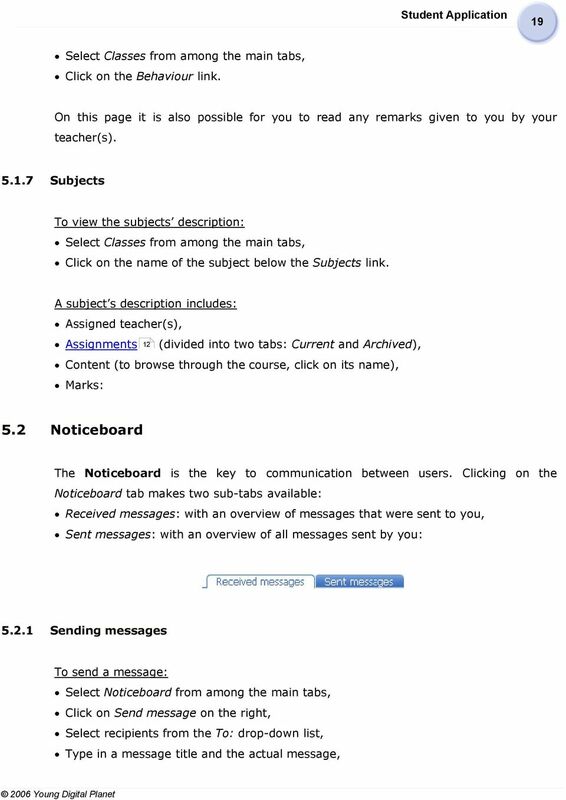 21 Student Application 21 Click on the Received messages or the Sent messages sub-tab, Check the box next to the message title (checking the top box automatically selects all boxes), Click on the Remove message button on the right, Confirm by clicking on OK (or click on Cancel if the messages are not to be removed). 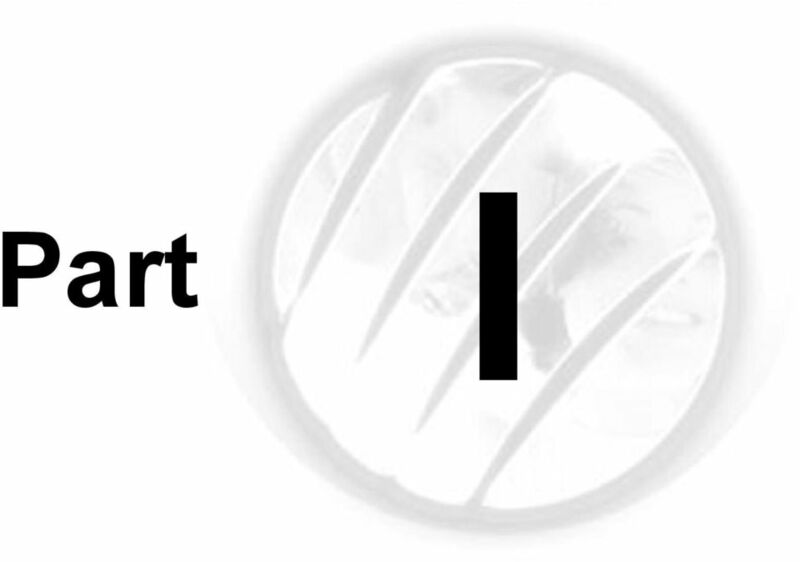 Note that you are always asked to confirm the removal before any deletion occurs. 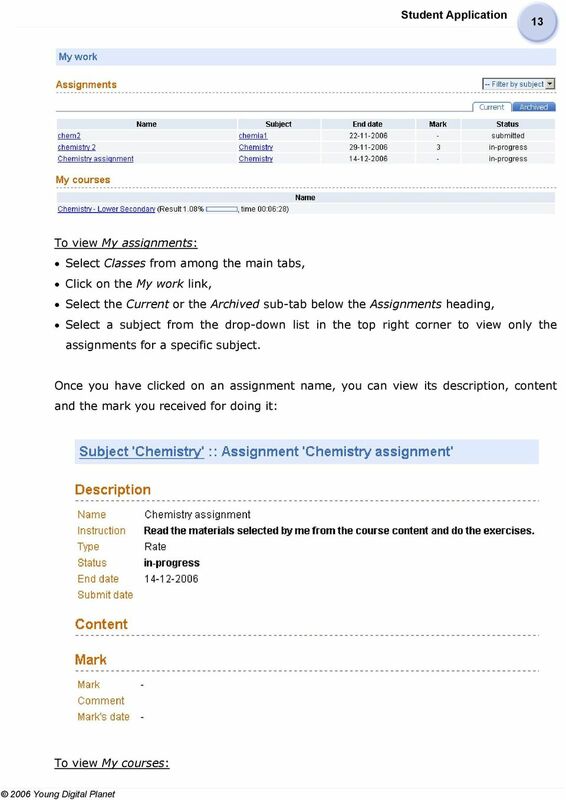 Note that it is absolutely essential to check the elements you want to delete. Otherwise, no deletion will occur. PLATO Orientation Guide #1 PLATO Website and Account Information The website address for PLATO is: http://plato.smc.edu The first time you log on to PLATO, the website will ask you for an account number.